I love having weekend getaways and this one was perfectly timed, because I was so much in need of getting out of the city and switching off for a while. I keep falling in love with the city. This is my second time visiting Milano and both due to Fashion Week. If you have missed mi Insta stories, catch up on my Instagram feed on what I have been up to. We literally arrived on Friday night and left on Sunday late evening. Therefore our schedule was packed from morning until evening and we just didn't stop. So it felt like we were there for longer, but on the other hand Monday morning was so, so tiring. We have basically finished all major sight seeings last time when we were there. Therefore, let me share with you some tips on where to go, what to see and what you can't miss around the city! Interested in reading other travel guides and diaries from different destinations too. The significant image of Milan, the gothic cathedral is dedicated to St Mary of the Nativity and it is the largest church in Italy. The architecture is beautiful inside and out and the view of the city on the top of Duomo is worth it. Be aware that there is usually a big queue. The beautiful and the oldest shopping arcade is worth to visit even if you don't tend to be spending money here. It is also located just next to Duomo, so why not go through it, right? This arcade was named after the first king of Italy. Located in the nort of Milan and it was built in 15th century. Not it is a place where you can be able to find art collection and city's museum. Navigli is a district around five canals. The popular touristic spots great for market, coffee shops or nightlife is around Naviglio Grande and Naviglio Pavese. You will get totally different vibes around this area! Brera is a district in the historical part of Milan and it is centered around Brera street. This district is very artsy and with bohemian atmosphere. You can also find many historical buildings around this area, such as Pinacoteca di Brera (Brera Art Gallery) in Palazzo Brera, the main public gallery for paintings. This is one of the two largest cemeteries in Milan. The place was designed by the architect Carlo Maciachini and it was aimed to group number of small cemeteries around the city into one single location. It is a massive place with great sculptures and famous graves. This basilica is located in the nort of Milan and is considered to be one of the ancient churches built by St. Ambrose in 379-386. The Royal Palace of Milan was a place where government was based for many centuries. However nowadays it is a place for culture, expositions and exhibitions. Located just on the right of the Duomo cathedral and Museum Novecento. Santa Maria delle Grazie church has not only beautiful architecture, but also known for the Leonardo Da Vinci's masterpiece fresco of The Last Supper. This church is one of the Renaissance art's most important reference and it was listed on UNESCO World Heritage List in 1980. Make sure to book a visit in advance too! Is a 20th century musuem located near Duomo. This museum has also a bookshop and a restaurant-bar at the top overlooking on the Duomo cathedral and square. How to get around in Milan? Milan City Center is pretty convenient to walk around. However it is pretty easy to get around by tube/metro or their trams. The price for a ticket is €1.50 which is valid for 90 minutes after stamping. Alternatively, you can busy a one day ticket valid for 24 hours after stamping for €4.50. More information on ticket you can find on their ATM website. 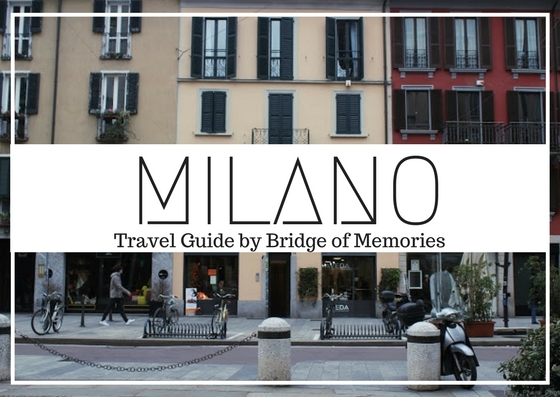 Where to eat and drink in Milan? Where to shop in Milan? We have flew to Milan from London Stansted Airport by Ryanair. Milan has 2 airports (Airport Malpensa and Bergamo Airport) which is about an hour away to Central station in Milan. To get to the city center from the airport we have used airport buses, which you can easily see and buy tickets on place outside of the airport in Milan (if you would like to book tickets in advance, you Terravision buses which goes both to Bergami and Malpensa airport). There is also a train going to Malpensa airport if preferred. During our weekend stay in Milan, we have booked our lovely cosy apartment through Airbnb. Book your next stay wherever through this Airbnb link to get £12 off your first booking.